How cool is this? Color coding your own mini book collection? I am so inspired by this image right now that I feel like dropping everything I have lined up for the day and instead start tweaking my tiny book cabinet. *Wonder if I have enough books to color code them? * We wouldn't know unless we find out, now would we? Hmmm! Back in the day we used to read the same books at the same time and call each other in between and discuss, "What the 'F' is going on with 'XYZ' character in the book?!?!" ... "How can he cheat one her!?! Noooo!" and the classic while reading Eat Pray Love "We, too, need to run away and find our identity!" and we both had 'just' got married [to our respective husbands, of course!] in 2007 when the book had come out! We were so silly ... and still are! We still have plans to move to a remote beach somewhere, open up a beach-side bar and spend our lives [away from technology, shoes and bags] sipping mojitos, sun bathing and working only when we ran out of money ... and then go back to sipping mojitos ... again! It is a fabulous plan, if you ask me! Coming back to the Mini Shopaholic, ... I was gonna do a book review since I haven't done that in ages now but now I couldn't be bothered. The book is not worth it ... This is the third consecutive book by Sophie Kinsella in last three years that I haven't liked much and worse this was supposed to be one from her 'Shopaholic' series and after a longgggg time! Total waste of my time! Bummer. However, on the bright side I have been reading again, ferociously! On Monday 23rd August I had confessed about not having read a single book since March 2010. Ever since the confession, the guilt was eating me alive. How can I possibly not read for that long? Less T.V., Less online shopping [*cough.cough*] and more reading! That's so sweet how she sent you that. I used to read books with my friends all the time but I haven't done that in years. Bummer to hear that the book wasn't good. I was going to buy it but I was in no rush to read it because I didn't like the previous two either. reading this post made me smile - i'm so happy you enjoyed my bookworm post and the rainbow library photo :) us bookish blog girls must stick together! LOVED "life of pi" and am currently finishing up "let the great world spin." i have been reading diary of anne frank...started in march 2010 and have finished almost half of it...now its laying on my bedside table, unfinished....i guess im in hibernating mode as far as reading goes!! I just love your way of life:to work to sipping mojitos at some beach around world and when the bucks run away, work more to buy more mojitos, hahah...about your how-to-get-more-time-to-read drama, you've tried to read Dear John? I read it in two nights ( and after was almost fired for sleep in my desk, hahaha). Reading is good for the soul! And i love the shopaholic series for some light entertainment! I loved the Life Of Pi! Such a fab book and I've actually got a friend called Richard Parker, but he aint't no tiger. I have to read bitche on a budget. That was so sweet of her. Hope you have a gret day beautiful! I can't go to sleep at night until I have read at least a few lines of whichever book am reading right then......n I sooooo identify with the shopaholic series!!! (Sigh! that's us!) I can live without blogging, shopping (I guess! ), surfing the net, facebooking, TV etc..etc......but NOT without reading!! Awe I love besties like that! I'm glad to know about this book, I had a hard time getting into one once can't remember the name, but I read like 4 chapters and gave up! What no pic of you?!! That shelf is pretty delish. aww so sweet of Anita and I love the pic of the color coded book cabinet but of course I have a much tinier room and my cabinet would be 1/6th of this but I am absolutely jealous of the owner of this fab shelf. And mini shopoholic was such a drag!!! uff what has happened to sophie kinsella ???? Your plans for a beachside bar sound fabulous - I'll certainly come to sip mojitos with you! Reading - yes! Less blogging - please no! Have you tried Amy Tan?-- read joy luck club and kitchen god's wife. The others lost me! I am a huge book worm!! 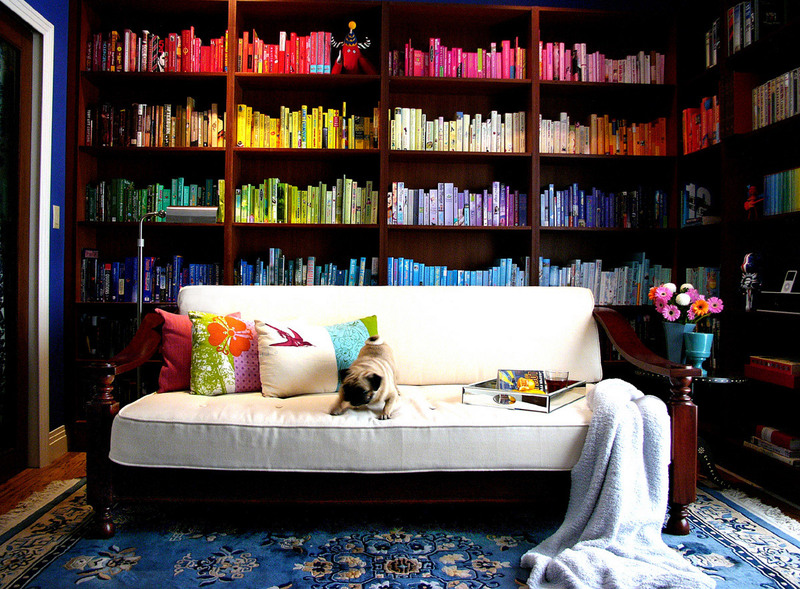 I love the colour coded bookshelf! And so sweet that Anita sent you the book. I really liked this post. But I will never show the first picture (color coding book collection) to my wife. I will let you guess why. I really like books and reading but with internet age I read a lot on net these days. Everyone needs an Anita in their lives! Your post was such a sweet tribute to your friendship. I will visit you at the beach. BTW, I am currently reading a book on how to get your kids to love doing their homework....and I am verrrry skeptical! I love the idea of color coding! I can't wait to this when I have a new shelving system. Love that picture and it's so inspiring...I have a bookshelf that needs some serious attention. Awwww...that's so sweet of Anita...to have sent that book to you! This reminds me - I have fallen off my 'trying to read' habit yet again! Your post has inspired me to get back on it asap! Have been reading all your posts...saw your pics...you look radiant babes! I totally love the idea of color co-ordinating the library.. might become difficult to find the book you're looking for though..but easier if you remember the cover color ofevery book. Good idea, looks nice at least. That's what matters..
reading is always fun! And I never go through to the end of books I don't like...just dont push myself enough :) and I LOVE the bookshelf! Love love love the bookshelf...NEED A BIGGER HOUSE and more space..even if it cant be so big, atleast one that allows me to have one! Sadly, in my NEW family I am the only reader so no one would understand the need for a bookshelf. And thank you lotssss for all the lovin...miss you much!